In order to deal with autonomous navigation, robots must obtain information about the environment through sensors and thereby identify safe regions to travel. Outdoor navigation in unknown terrain is certainly a complex problem. Beyond obstacle avoidance, the vehicle must be able to identify surface where it can navigate safely. The irregularity of the terrain and dynamics environment are some of the factors that make the robotnavigation a challenge task. Usually it is desirable that the mobile robot (vehicle) have the capacity to move along the road and avoid obstacles and non-navigable areas. Since these elements usually have differences in color and texture, cameras are a suitable option to identifynavigable regions. 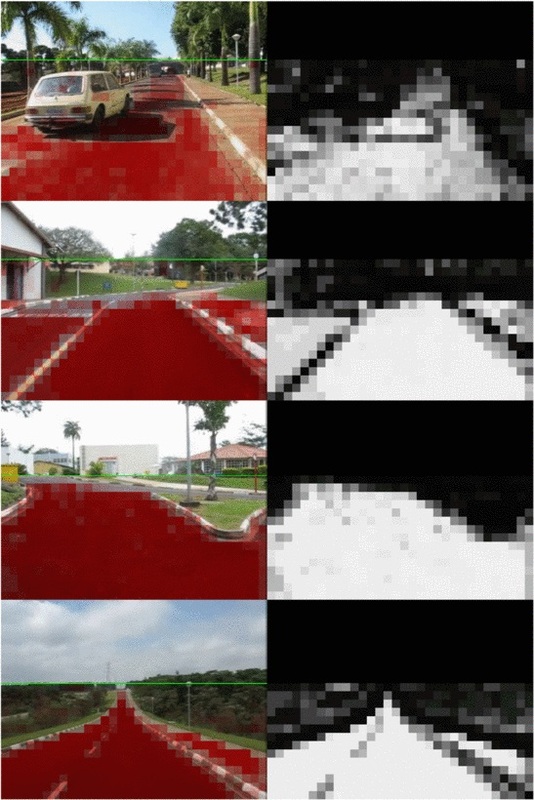 Several techniques for visual road following have been developed based on certain assumptions about the road scene. This work presents the use of a set ANNs in order to improve the road identification. More specifically, we present a image classification approach based on many ANNs that use different features obtained from images as input and combine all outputs to draw one improved classification. This stage transforms an image into a set of sub-images and generates image-features for each of them. More specifically, an image I with size of (M x N) pixels is decomposed in many sub-images with (K x K) pixels, as shows Fig. 1(a) which is transformed into Fig. 1(b). This subdivision is described as follows: The element I(m,n) corresponds to the pixel in row m and column n of the image, where (0<m<M) and (0<n<N). Therefore, sub-image (i,j) is represented by group G(i,j) that contains all pixels I(m,n) such that (iK<m<(iK+K)) and (jK<n<(jK+K)). For each group, many image features are generated. These features will be used by road and horizon identifiers that determine whether the group, or sub-image, belongs to a particular class or not. If the sub-image is classified as belonging to a specific class, e.g. road class, then all pixels from that group are considered as belonging to the same class. Fig. 1(c) shows sub-images belonging to road class painted in red. This strategy has been used to reduce the amount of data, allowing faster processing and obtaining information like texture from sub-images. A classifier is responsible for classifying a sub-image as belonging or not to a specific class. It is composed by several different ANN, as shows Fig. 2. Each ANN uses some, not all, features generated by the previous stage as input. In other words, these ANN are distinguished by the combination of features used as input. The ANN used in our system consist of a multilayer perceptron (MLP), which is a feedforward neural network model that maps sets of input data into specific outputs. We use the resilient propagation technique, which estimates the weights based on the amount of error in the output compared to the expected results. The ANN topology consists in, basically, two layers, where the hidden layer has five neurons and the output layer has only one neuron, as shows the Fig. 3. The ANN was trained to return value 1.0 when receives patterns belonging to a determined class and to return 0.0 when receives patterns that does not belong to class. The input layer depends on features chosen for each ANN instance. Since the number of neurons is small, the training time is also reduced enabling the instantiation of multiple ANN. Source code and sample data are available in the Repository.